Launching the Benefit Impact at St Joseph’s Church in Upper Hutt last month with a Mass, Cardinal John Dew illustrated the importance of this Archdiocesan Jubilee of Mercy project to help those on a benefit. 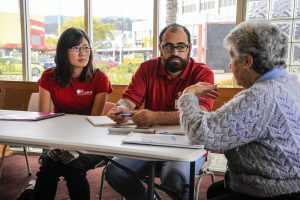 Run from 10–13 May at the parish and organised by Wellington Catholic Social Services, Hutt Valley Benefit Education Service Trust and Caritas Aotearoa New Zealand, the Benefit Impact offered beneficiaries a welcoming place to discuss benefit entitlements and get advice assistance from trained advocates. ‘We had 40 advocates available able to discuss some complex situations. Hutt Valley BEST (Benefit Education Service Trust) has over 50 cases resulting from the Impact,’ says Lisa Beech, Advocacy & Research Manager for Caritas Aotearoa New Zealand. Most cases involved payment of disability allowance, which can help with specific medical costs. Other cases involved making sure people were on the correct benefit, supporting people making their first benefit application, and advising non-New Zealand-born residents living in this country with correct information about their benefit entitlements. ‘In some cases, the Benefit Impact event has resulted in beneficiaries accessing an increase in their income of over $40 a week, which will help improve their quality of life,’ says Ms Beech.